Hampshire Generators were called in to see if we could assist with a major modification of a 300kVA Diesel Generator installation in a high-profile shopping centre in Winchester, Hampshire. The old 1990’s 300kVA Rolls Royce (Perkins) engine was connected to the building’s water circuit rather than be cooled by a standard set-mounted radiator. 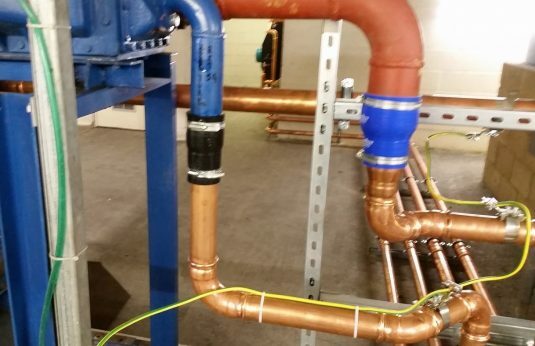 This cooling system was being decommissioned, which meant that the unit would lose its cooling method altogether – the customer and his contractor thought that a completely new diesel generator installation would be required at a massive expense but after talking with Hampshire Generators they were convinced that it was possible to modify the existing installation to have a remote radiator fitted. This particular generator engine has a jacket water cooling circuit and a charge air cooling circuit – the original system designers had used a air-to-water heat exchanger to handle the charge air cooling and a water-to-water heat exchanger to handle the jacket water cooling – these were connected in series to the building’s cooling water. This was a clever installation and worked well – until the secondary circuit was to be removed, then it was useless. The first thing to do was to establish an installation position of the remote radiator; not an easy task in a building with such a premium on space. Then design a pipework, pump and control system that would give the correct flow of coolant on the secondary circuit to give the correct cooling to the engine at full load. This was all finished at a pre-order stage to convince the customer that this would work and at a fraction of the price of replacing the whole standby generator installation. 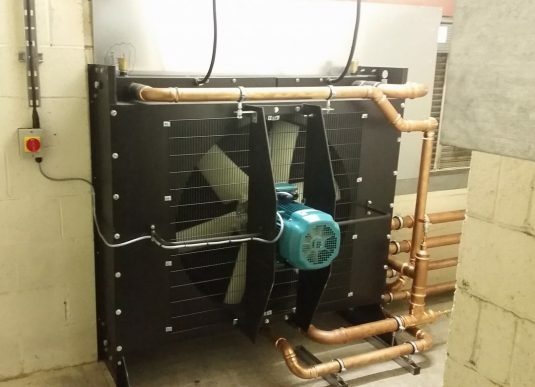 It was obvious a twin-core remote radiator would be required – one for the jacket water and one for the charge air cooling – the air-to-water heat exchanger was retained and the jacket water heat exchanger removed giving two separate secondary circuits. 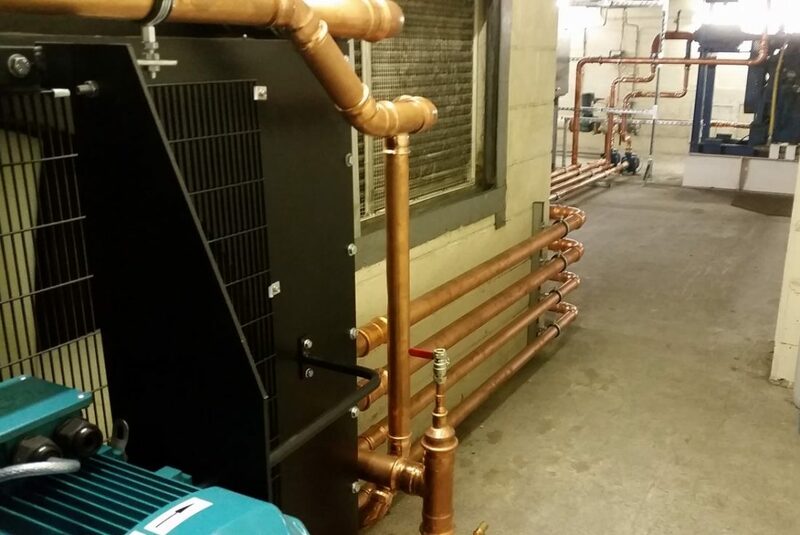 The remote radiator was designed and manufactured specifically for this installation and used a high-flow fan powered by an electric motor. This was powered directly off the diesel generator alternator (via the controls and motor starting panel) so it would only start when the generator was running. The same for the pair of coolant circulation pumps on each circuit. After all the components were delivered by Hampshire Generators the entire system was installed – then came the task of proving this generator modification would work in real life, not just on paper. We arranged the supply of a suitable load bank and long cables. The unit was started, checked over and then 260kWe was loaded onto it (that’s its standby rating of 330kVA at 0.8pf) – the cooling system performed perfectly and sat at this maximum load for several hours. This standby power system modification saved the customer tens of thousands of pounds. An expense they were ready to sign off on and pay until Hampshire Generators stepped in and made them think about it. We don’t only sell and service standby diesel generators in Winchester, Southampton, Basingstoke and the surrounding areas but the whole of the south of the UK – have a look at our generator servicing offers or call us to get expert advice. Hampshire Generators offer a great range of generators, from heavy duty to residential, agricultural to portable. We also stock welder generators, petrol generators and leisure generators too. We are always on hand to help you find the best generators for your needs. Explore our selection or get in touch on 01329 722390 to speak to one of our friendly staff.